We weren’t alone when we were hoping that by 2014 there would be robots doing our dishes and vacuuming our rugs but that dream has yet to be realized. However, many of the innovations on display at the 2014 Consumer Electronics Show in Las Vegas fused everyday home appliances with WiFi and smartphone technology, providing attendees with a glimpse into the future of high-tech households. Judging from the products and ideas that debuted at the show, one thing’s for certain — it’s time to invest in a smartphone if you haven’t already. Wouldn’t it be nice if you could save room in your kitchen and expand your counter space by removing your stovetop burners? Fortunately, Whirlpool is working on making this dream a reality. The home appliance company introduced an interactive cooktop, which would work like one giant touch screen. 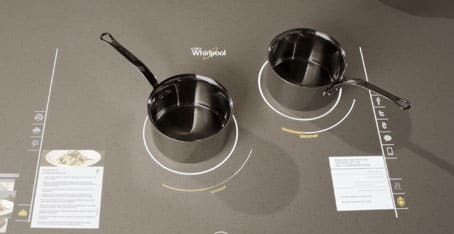 By using induction to heat the pots, the interactive cooktop will allow users to cook their favorite dishes while keeping the surface cool to the touch. But the cooktop will not just be for boiling water – the high-tech touch screen will also display everything from recipes to Facebook and Twitter updates, pulling the information from the user’s smartphone. It’ll also be able to stream music, providing individuals with their own cooking soundtracks. While this device is still in its development stages, Whirlpool is determined to build this interactive heating device in the near future. If you have a habit of leaving your house without your keys, this new home device may be for you. The smart lock from Goji will eliminate the need for carrying around clunky metal keychains. With this appliance, individuals are able to enter their homes with a simple phone app or a Bluetooth connection. This lock also enables others, such as family members or babysitters, to enter the home without the homeowner present through the smartphone app. A camera is also planted in the lock, allowing users to check to see who is at their front doors without looking through the windows or peepholes. One of the most intriguing appliances at the Consumer Electronics Show was a “smart” slow cooker from CrockPot that features WiFi technology. The home appliance business paired up with computer electronics company Belkin to create the innovative device, which can be controlled from the user’s smartphone. That’s right – this new CrockPot allows individuals to lower or raise the temperature and change the cooking time with just a few pushes of the buttons on their cellphones. To activate this home automation technology, users need to install the WeMo iOS app on their iPhones. Belkin isn’t stopping with slow cookers. The company also announced a line of LED lights that use the WeMo home automation system, which means individuals can turn their lights on and off or change their brightness without even being in their homes. Electronic giants Samsung and LG debuted new technology at this year’s tradeshow that capitalizes on their smartphone technology. Both the Samsung Smart Home and the LG Homechat programs let users stay updated on all of their home appliances through an easy-to-use smartphone app. These programs would apply to kitchen devices such as stoves and ovens to household products like the washing machine. LG is hoping to add a texting feature to their system, which would allow homeowners to send written commands to their appliances. Meanwhile, the Samsung is going to add cameras to their devices, so users can check up on their home activity. It seems like the day of passive appliances is coming to an end. Manufacturers are taking into account the complexity of our daily lives with thought to design that manages those elements better and easier. By enabling us to multitask and manage appliances and chores with a single device, running our homes becomes more enjoyable and much more efficient.